Artist Jessica Jackson Hutchins in her installation Reason to Be. Photo: Laura Fried. WHEN I TOUCHED DOWN IN WASHINGTON on a recent Thursday for the third edition of the Seattle Art Fair, the city was uncharacteristically hot and hazy, enveloped in smoke from forest fires raging nearby in Canada. But even the miasma couldn’t dampen my excitement about visiting the metropolis that loomed so large in my 1990s teen imagination. Seeking some classic Seattle vibes, I quickly made my way to Pike Place Market for a strong coffee and zine browsing at the radical Left Bank Books. The atmospheric conditions rivaled LA at its worst, obscuring the Puget Sound and Jeff Bezos’s Amazon biodomes under construction just a few blocks away. The city is on the precipice of a major swell: The current “crane capital of America,” more than one thousand new residents arrive every week to work at Amazon and related enterprises. The most prescient work on view, at both the fair and around town, alluded to new forms of collectivism. At the University of Washington’s Henry Art Gallery, a retrospective of Seattle-born artist Doris Totten Chase (1923–2008) pairs her early abstract paintings and wood sculpture with her experimental computer-animated works of the 1970s and 1980s, which she made after moving to New York at age fifty-two. Across campus at the Jacob Lawrence Gallery, director Emily Zimmerman mounted “Untold Passage,” a group show on immigration by artists with connections to the Northwest, such as poet Ocean Vuong and artist Mary Ann Peters. At the fair, Peters presented the world is a gardena large-scale sculpture comprising a cluster of flowers viewed through semitransparent mesh, obliquely referencing her family’s migration from Syriain collaboration with Seattle’s James Harris Gallery and commissioned as part of the Projects program. Left: Performer in Ellen Lesperance’s W.I.T.C.H. 1985 in Pioneer Square. Right: Artist Shannon Ebner and Henry Art Gallery associate curator Nina Bozicnik. In its second year under the leadership of artistic director Laura Fried, a Los Angeles–based independent curator, the Seattle Art Fair included one hundred galleries in the massive CenturyLink Field Event Center. While last year’s public program discussed Northwestern identity, this year the fair focused on forging deeper connections with local institutions. The Frye Art Museum collaborated with the fair to premiere Gerard & Kelly’s Modern Living, projected in a black-box buildout. The two-channel video installation depicts site-specific performances featuring members of the LA Dance Project at Philip Johnson’s Glass House in New Canaan, Connecticut, and the R. M. Schindler House in Los Angeles. While Gerard & Kelly’s installation probed the history of modernism, the fair delved into the history of Seattle. 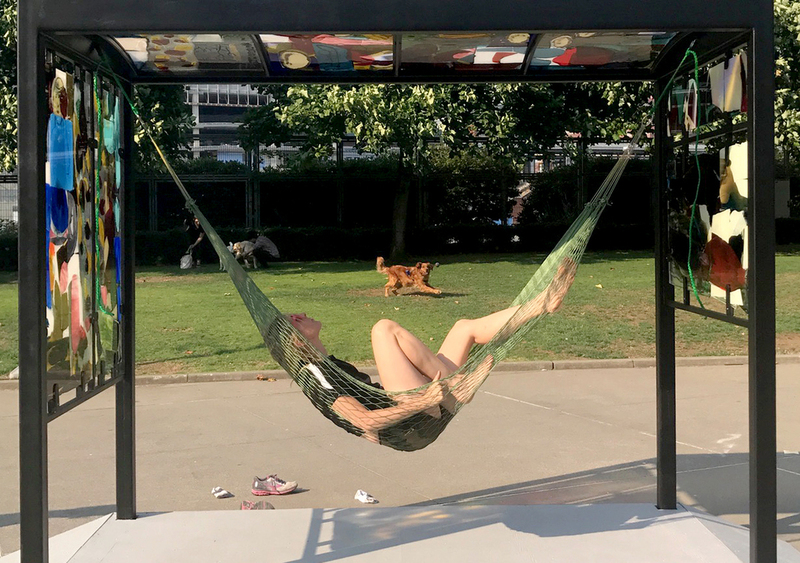 On the north side of CenturyLink Field, Portland-based artist Jessica Jackson Hutchins concocted the cozy bespoke glass installation Reason to Be in a decommissioned bus station, with a hammock as a space of respite. A few blocks north of CenturyLink, Los Angeles artists Dylan Mira and Erika Vogt created the multimedia installation Pool at Union Station, an unused train station built in the early 1900s that today serves as a public gathering place. (Think of it as a rainy-climate version of New York’s High Line.) Vogt created white foam-based sculptures resembling spa “ruins,” while Mira contributed a three-channel video and cauldron-like vessels filled with flowers and “time-traveling” ingredients such as mugwort. The sculptures suggested stylized luxury in the space of waiting. Artist Naama Tsabar questioned the architecture of display in her collaborative musical performance Closer, performed inside the fair with the vocalist Fielded (Lindsay Powell) on two sides of a wall. Powell wore a baseball cap, embroidered with the phrase “Women in music are dangerously underrated,” by the very underground designer Keep Brave. Also underrated and dangerous: the powerful backstory of Portland-based Ellen Lesperance’s performance W.I.T.C.H. 1985. Left: Artist Dino Matt with Amy Adams of Adams and Ollman. Right: Art Agency, Partners’s Matthew Thompson with dealer Shulamit Nazarian. For several years, Lesperance has been investigating chapters of the feminist group W.I.T.C.H. (Women’s International Terrorist Conspiracy from Hell), currently active in Portland. She created a series of thirteen cloaks based on a garment worn by one of its members at the Greenham Common Women’s Peace Camp, an anti-nuclear occupation from 1981 to 2000 in Berkshire, England. Lesperance invited local artists to wear the cloaks and perform at the fair and in nearby Pioneer Square. The former site of the Casino gay bar (one of the first on the West Coast), the gentrifying neighborhood today hosts the homeless along with high-end galleries and shops. Lesperance and her performers marched around with battle-ax-shaped signs, played piccolos, read poems and incantations, and mashed up pigments with a mortar and pestle. At Saturday’s performance, artist Wynne Greenwood (of Tracy and the Plastics) showed up to watch, on her way to riot grrrl mecca, Olympia, Washington. Back at the fair, Seattle’s recent history figured prominently in an installation of Kurt Cobain’s art and personal effects at UTA Artist Space. The highly anticipated presentation was the art-fair debut for the gallery arm of LA’s United Talent Agency. The booth featured two paintings, a handful of drawings, handwritten lyrics, and a love note from Cobainincluding the surrealistic canvas used for the cover of Nirvana’s 1992 compilation Incesticide. UTA secured Cobain’s work through Courtney Love, who couldn’t attend due to a filming conflict. Though Cobain’s paintings weren’t for sale, UTA’s closely hung booth included works by blue-chippers such as Nate Lowman, Josephine Meckseper, Elizabeth Peyton, and Richard Prince. Left: Artist Ellen Lesperance with installation of W.I.T.C.H. 1985. Right: Artist Gisela Colon. Works that emphasized craft and process also received enthusiastic responses. Adams and Ollman, located for the past five years in Portland, showed all West Coast works: paintings by outsider artist Marlon Mullen, ceramics by Dino Matt, and Lesperance’s gouaches based on sweaters worn by feminist protesters. Los Angeles’s Roberts & Tilton presented a beaded installation by Jeffrey Gibson along with works by Beyte Saar and Kehinde Wiley. Variations on the theme of political conceptualism-meets-craft could also be seen in Jessica Stockholder’s new works at Chicago gallery Kavi Gupta, Summer Wheat’s acrylic-on-aluminum-mesh paintings at New York’s Fridman Gallery, and Michelle Grabner’s gingham paintings and bronzes in the shape of woven blankets at Portland’s Upfor. Spirits were high as the fair wrapped up its first full day. Twilight sun bathed the roof of the Thompson Hotel, where Los Angeles’s Night Galleryfirst-time participants in the fairhosted a cocktail hour. Night cofounder Davida Nemeroff mixed with LA friends, collectors, and noted architectural firm Olson Kundig’s principal Jerry Garcia. Across town in Capitol Hill, the Pacific Northwest scene gathered at the hip Bateau, cohosted by Adams and Ollman, PDX Contemporary, and Upfor. Seattle Art Museum curator Catharina Manchanda and Henry Art Gallery curator Nina Bozicnik mingled among the crowd. “People look and respond on a personal level,” said dealer Amy Adams over oysters and fries at Bar Melusine next door. “It’s not about what museums have.” Sharon Arnold of Seattle gallery Bridge Productions concurred. “The lack of convention allows for a lot of breathing room to be creative,” she said of her hometown. To borrow a catchphrase from Austin, another 1990s cultural capital, let’s hope they can keep it weird in this next great tech boom. Left: Artists Erika Vogt and Dylan Mira. Right: Ellen Lesperance (center) and performer in W.I.T.C.H. 1985 in Pioneer Square. Left: Dealer Greg Kucera (center) with artists Margie Livingston, Victoria Haven, Sherry Markovitz and Peter Millett. Right: Collector Mark Tilbe, Night Gallery dealer Davida Nemeroff, art consultant Isaac Joseph, and collector Dwayne Epp. Left: Dealer Iliya Fridman with artist Summer Wheat. Right: Curator Miranda Belarde-Lewis and artist Storme Webber. Left: Seattle Art Fair artistic director Laura Fried with Martyr Sauce founder Tariqa Waters. (Photo: Laura Fried) Right: Dealer Theo Downes-LeGuin of Upfor Gallery in Portland.